IBM has announced that it’s designed a new kind of ultra-dense chip, which squeezes in four times as much computing power as the best silicon currently available. The ability to squeeze ever more processing power into the same small processors is a result of shrinking the fundamental transistors that make up chips. Until recently manufacturers have been able to produce them at a scale of 14 nanometers, and are now transitioning to a regime where 10 nanometers is the standard. 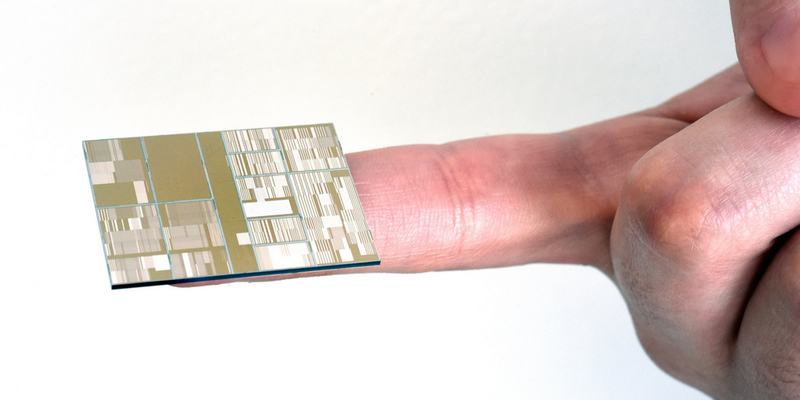 IBM’s announcement, reports the New York Times, ushers in the possibility of creating 7-nanometer transistors. For some context, a strand of DNA measures 2.5 nanometers in diameter. The company claims that it’s made possible by using silicon-germanium in the manufacturing process rather than pure silicon. The new material choice allows transistors to switch faster and also use less power—in turn allowing them to sit more densely on a chip. Indeed, IBM suggest that processors with more than 20 billion transistors should be a possibility—about four times that of today’s best chips. It’s worth noting that the chips are in advanced research stage, as opposed to being consumer-ready, but that doesn’t detract from the announcement. For all the talk of death of Moore’s Law—which suggests the number of transistors per square inch on chips should double every two years—IBM’s announcement suggests that it could be safe, at least until 2018. It remains to be seen if the silicon-germanium will be embraced by the chip industry, but if it’s the only way to keep Moore’s Law alive, it may not have much choice.